I’ve finally succumbed to holiday laziness and am blogging two beers in one post. I imagine everyone is too hungover from New Year’s to even think about beer however, so no one will see it. So both of these beers had a similar problem actually. When I poured them they fizzed up and gave a big head, then went completely flat. Now – I’m no doctor, but I think this might be because I was trundling them around on cobblestone streets and shaking them all up. If that’s the case then I have 10 more flat beers waiting for me, and they’ll all be warm too since the hotels don’t have fridges. Turns out stocking up in Mexico City wasn’t the best idea ever. 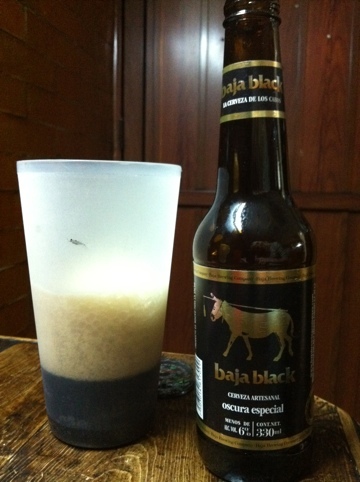 The Baja Black (a 6% Shwarzbier) was really nice, despite being warm and flat. It had an aroma of dark stonefruit, licorice and roasty, chocolate malt, and in the mouth it was sweet with a dry finish. It lacked a little in mouthfeel, but I think it just needed some fizz. 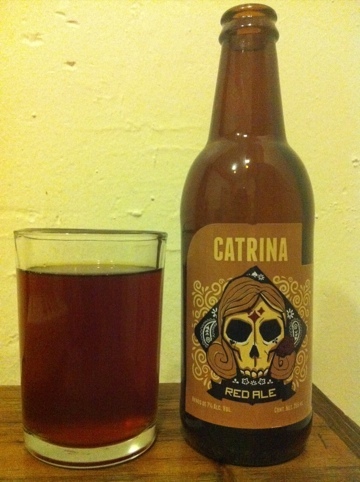 The Catrina (Cerveceria Hacienda, Red Ale, 7%) did not fare so well. It needed to be cold and carbonated, but even then I’m not sure it would have been great. There was something slightly strange and sickly about the aroma – like caramel and feet, and the flavour, though not so bad, was a bit boring. On the plus side – it had a nice bitter kick at the finish, and the label is cool. So it’s New Years Eve in Oaxaca tonight, and I have a very good feeling about it. The main square (zocalo) here has been packed with people eating, dancing and playing music for the last two nights, so tonight should be big. In preparation I’ve put a special bottle of beer that Rodolfo gave me into some coldish water, and once I’ve found a vessel to drink it out of, I’ll be ready to party!